Jim Carlson (top-left), Sandy Masin and Will Morgan are labor-endorsed candidates seeking to return to legislative seats they lost in 2010. Jim Carlson, Sandy Masin and Will Morgan are hoping voters who bounced them from office two years ago will show buyer’s remorse in 2012. All three DFLers represented suburban areas south of St. Paul, including Burnsville, Eagan and Lakeville, from 2007 to 2010, but they were swept out of office by a wave of support for “tea party” Republicans two years ago. What have Republicans accomplished since taking control of the Legislature? One state government shutdown, two divisive constitutional amendments and a $2.4 billion I.O.U. to public school districts. Morgan, Carlson and Masin believe voters want a Legislature that will focus on moving Minnesota forward with real solutions – not scoring political points or advancing an extremist ideology. Carlson, a retired mechanical engineer from Eagan, is running against Sen. Ted Daley in District 51 (map). Daley was among the most vocal supporters of so-called Right to Work legislation, a direct attack on workers, collective bargaining rights and the middle class. Rather than compete in a race to the bottom, Minnesota should be developing an economy prepared to compete for the best jobs of the future – and that means making investments in K-12 and post-secondary education, keeping our infrastructure sound and preserving our high quality of life. 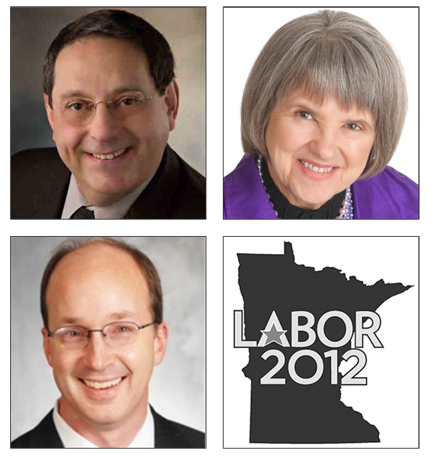 Find a complete list of Labor 2012 endorsed candidates at MiddleClassMN.org. Who’s running to represent you? And where do you vote Nov. 6? Find out here. Labor-endorsed candidates up and down the ballot need your help. Click here to find a phone bank or a door-knock near you.